Is Twitter censoring Donald Trump? On Saturday, the Gateway Pundit’s Jim Hoft accused Twitter of censoring Donald Trump’s messages. 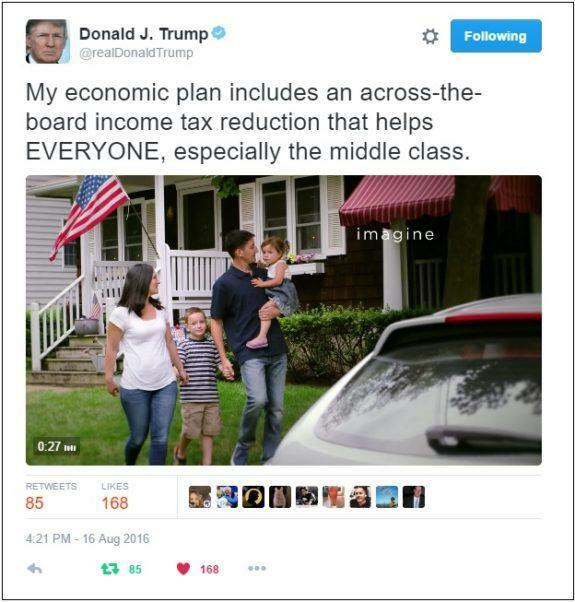 On Tuesday, he said, the GOP nominee posted a short message about his tax plan, but it appears to have been removed. According to Hoft, the tweet was deleted the day it was posted and is no longer on his Twitter feed. Moreover, he said Trump’s tweets usually garner many thousands of likes and retweets. This one, however, only accrued a few dozen. We took a look at Trump’s Twitter feed, and verified that the message is, in fact, gone, although it’s not been verified if Twitter took the message down or if someone else did. Hoft says it’s not the first time this has happened. In July, he said, the social media site was “caught” concealing a tweet asking for donations. Ohh you can see @jack is acting up again at Twitter. Censors @realDonaldTrump. #FreeMilo Can't stand #FreedomOfSpeech! Indeed, it seems that censorship has become a major tool of the left this campaign season and no doubt, we’re going to see a lot more of it.